Even if it's flat as a lake out there, paddle boarding is always a great option on a nice day. It's a perfect excuse to get out on the water and enjoy the weather. In addition, it's a terrific workout. (Trust me, you will be using muscles you didn't know you had) You can also paddle board at many different places in York, including the York River, Wiggly Bridge, Cape Neddick Beach, Cape Neddick River, & Long Sands. Paddle boards can be rented at both Liquid Dreams locations. 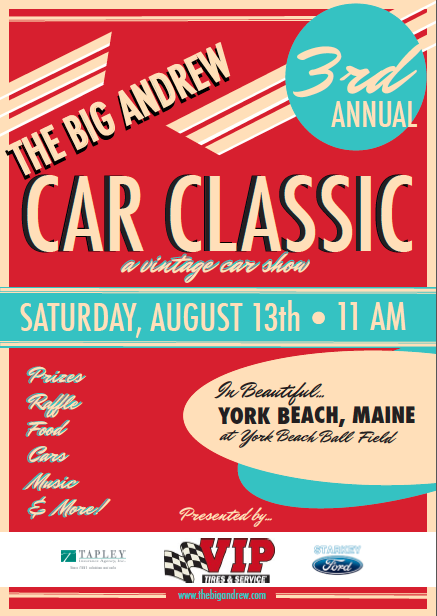 On Saturday, August 13th down at the York Beach Ball Field, the Big Andrew Car Show will be taking place. This is your chance to get up close and personal with countless beautiful and unique classic cars. All proceeds from the show go to the York Oncology Network. There are plenty of good fishing holes to discover in York, just be sure you get your fishing license first. Try somewhere along the York River, or test your luck at Long Sands where you may be able to catch a Striped Bass or two. 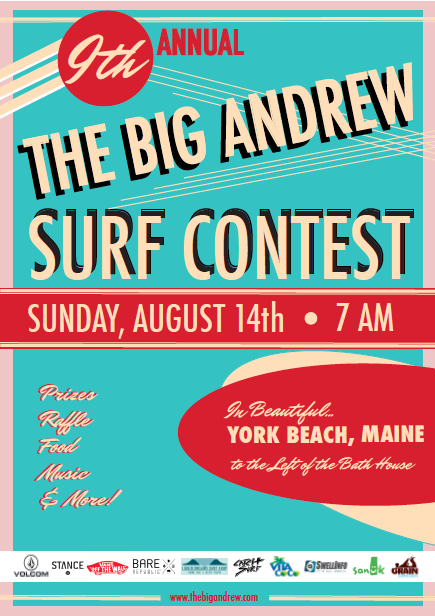 Come by Long Sands on Sunday, August 14th, for the 9th Annual Big Andrew Surf Contest Don't want to join the contest? No problem, there will be plenty of fun all day, including a huge raffle as well as a chance to win some awesome gear and prizes at the end of the day. There is even a huge cookout so you can get some great food at the beach. Just like the Car Show, all proceeds from the day go towards the York Oncology Network. Sponsored by Sanuk, Volcom, Liquid Dreams, Vans, Vita Coco and many more, there's plenty of awesomeness all around. "By showing your support, encouragement, and positivity for our community, you have not only given your time to those affected by cancer, but you have given the gift of hope. Many of the patients at York Oncology are physically and mentally exhausted. Due to your efforts, The Big Andrew Foundation will continue to be a voice that lifts our community and keeps us strong." To donate to this great cause please click here. There are so many different trails to choose from, with all sorts of different terrain. There's Mount Agamenticus, the tallest mountain in York; where the views are so expansive you can see all the landmarks of York and if you're lucky, and happen to have eyes like a hawk, you can even see Boston in the distance. The Fisherman's Walk and Wiggly Bridge are other great spots to take in the nature of York. Trailing right along the York River, there's plenty to see during your trek. These trails all happen to be dog friendly as well, so they're all great places for your four legged friends. With over four beaches to choose from, along with countless rivers and streams, there are plenty of options to spend the day at the beach. Set up camp at Long Sands and spend the day day swimming in the clear, cool Maine water. Claim a spot at Cape Neddick beach and you can spend some time exploring the tidal pools and rocky shore. Wherever you chose to go, it will surely be beautiful. Channel your inner foodie and try out some of the incredible food options down in Kittery. Lil's Cafe carries coffee from the Portland staple, Tandem Coffee Roasters, while also offering delicious baked goods. The local favorite is the classic cruller, although they often have special varieties, such as the chocolate espresso cruller. Stopping by around lunch time? Try out one of the gourmet sandwiches created at Maine Meat, only offered select days of the week, they are certainly worth the trying. Just down the street are two more incredible restaurants. Anju Noodle Bar and The Black Birch are two of the most unique restaurants in the seacoast area; they are sure to appeal to an foodie looking to try something new. There are plenty of quintessential tourist things to do, York is a summer tourist town after all. Start by taking a ride up to Nubble Light and enjoy the view of one of Maine's most beautiful lighthouses. Snap a quick photo for Instagram, it happens to be one of the most photographed lighthouses in the United States. Once you leave Nubble, take a pit stop at Dunne's Ice Cream for a scoop of Wild Maine Blueberry or Maine Whoopie Pie ice cream. Then head down to Short Sands and watch in awe as the salt water taffy is pulled in the window of The Goldenrod. Peruse the shops along the street and play some Skee-Ball at Fun-O-Rama. Finally, finish the day off at the York's Wild Kingdom, riding the carny classic; the ferris wheel.